While America still suffers with repressed wages, increasing poverty and a vanishing middle class, Wall Street and big Multinational Corporations are having a party. Bonuses increased 15% and are back to their pre-financial crisis excesses Corporations hording cash offshore increased 11.8% in 2013 to a whopping $1.95 trillion. According to the New York State Comptroller, the average bonus paid on Wall Street was $164,530 in 2013, the third highest on record. 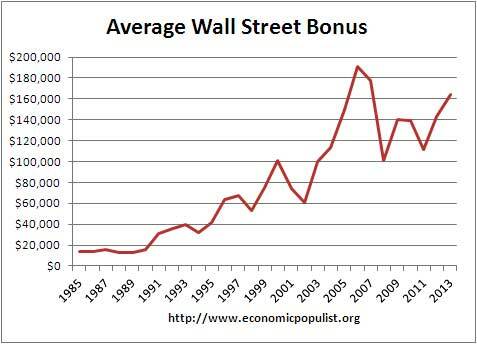 Below is a graph of Wall Street's average bonus and as we can see the greed and excesses just continue. The average 2012 salary on Wall Street was $360,700. This is 5.2 times larger than the average New York City private sector salary of $69,200. The 2013 bonus pool was $26.7 billion spread over 165,200 workers If an individual works 50 weeks, 40 hours a week for the $7.25/hr minimum wage, the gross annual income is $14,500. Wall Street accounts for 22% of private sector salaries in New York City while being only 5% of those employed. If Wall Street bonuses weren't bad enough, shipping good jobs overseas is clearly quite profitable for multinational corporations. According to Bloomberg, corporations are stockpiling cash, tax free, abroad and added $206 billion to their coffers in 2013. The offshore cash holdings now are $1.95 trillion. 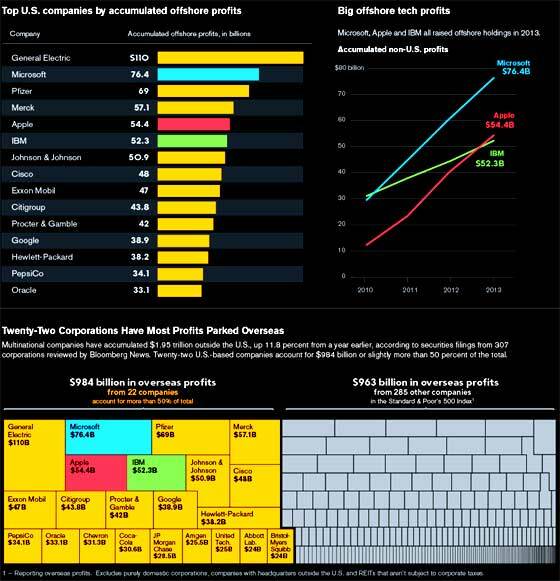 Three of the biggest labor arbitragers and offshore outsourcers of them all, Microsoft, IBM and Apple, account for 18.2% of the 2013 offshore cash holdings increase. All of these companies have fired top tier Scientists and Engineers and replaced them with cheaper foreign guest workers as well as moved R&D jobs offshore. Their actual production and manufacturing jobs are long gone to India and China. These companies also repackage copyrights, trademarks and patents into SPVs and park them offshore in the Cayman's and other tax havens. According to a Congressional Research Service report, multinationals reported 43% of their 2008 overseas profits were in such tax havens. Profit shifting is what it's all about instead of contributing to America and even innovating new products. Bloomberg created a graphic, reprinted below. Their visual really tells the story on how multinational corporations don't give a damn about America or even their own employees. They live and breathe for their tax avoidance weasel game. Congress has stalled on doing anything about the U.S. corporate tax code and corporations lobby to bring the money back tax free, only to distribute amount shareholders. Stopping their profit shifting, tax avoidance global game is simply out of the question for them as is investing in the United States. It seems at all costs these companies do not want to invest in America and most of all hire U.S. citizen workers. The reluctance almost seems like a corporate cultural thing, since America does have, after all, the best universities in the world with a highly skilled U.S. citizen labor force. Last year a GAO report showed the corporate tax code is a giveaway to mutlinationals. Yet in spite of repeated Congressional hearings, damning studies, and Bloomberg's outrageous 2013 statistics tabulations, nothing happens. Congress does nothing in the national interest regarding these corporations. Nothing changes while America continues to be hollowed out and great people still cannot find good jobs. Great article as usual. Keep up the fine work. The biggest American corporations are reporting record profits, but they are not investing their windfalls in business expansion, which would mean jobs. Nor are they paying profits out to shareholders as dividends. Instead, the biggest companies are putting profits into the corporate equivalent of a mattress. The latest data from the Federal Reserve, the IRS and corporate reports shows that American businesses last year held almost $7.9 trillion of liquid assets worldwide. Clearly there is a need of government intervention. For instance the government could decrease tax rate s for these company and should revise tax laws to make it more strict. This always shows that the labour market in the US is decreasing due to cost of labour and thus these big companies go for the cheaper foreign workers. However, this is the case in many countries in the world were foreign labour is more sought after than local labour due to cost. Is there actually any reason or law that foreign earned profits of multi national companies cannot be distributed as dividends? I am not aware of any. The stock holders can be people and entities from all over the world. MS products are used and purchased all over the world. US population is about 5% of the world population. PCs are eubiquitous arround the world. I checked an income statement of Microsoft and it showed 30% taxes paid on profit. US corperate tax is about 35%. MS income is mostly for IP. So there! Ha! What are you talking about? I think the US government should step in and help stop the tax evasion issue. They could do this by decreasing the tax rates, and improve the seriousness of the ramification of tax evasion. Therefore the lowered tax rates would give them incentive not to evade tax and the consequences would make them think twice before avoiding tax. If the US government can get wall street to stop avoiding tax, they would have more revenue to use to help create more jobs. The US government could implement a program to subsidize the salaries of companies who employ US citizens or provide tax reduction to companies who employ more US citizens. Therefore making it worth while for companies to employ locals instead of cheaper foreign labour.